Observing people has always been one of my favorite pastimes. I enjoy setting myself down with a book in a local café, pretend that I'm reading and then take a look at how the bartender is stressing out over clients, how people are enjoying or disliking listening to the story of a friend, people fighting verbally in cycling traffic, awkward situations of people meeting an old friend they would rather avoid today, other observers realizing you're also observing, all of that... I love it and every time it teaches me something. Recently, this fascination of observing people's daily behavior has gotten a bit more specific through the stuff I've been reading and the teachers I've met formally and on the streets. My observation has shifted towards the physical behavior of people: the postures they hold, hand gestures they use, their facial expressions, what parts they are holding when walking, etc. I have been focusing my attention on different closed and open positions - both static and dynamic - and what they communicate to me, and maybe communicate in a universal way that everyone intuitively understands. Also, one example everyone probably has heard of, is the test of the 'fake smile' research where they showed that holding a stick between your teeth - creating a fake smile - showed "physiological and psychological benefits from maintaining positive facial expressions during stress." Further, one of my "street" teachers once shared with me that he used simple coordinative movements to relax people who were suffering form high stress and tension in a psychiatric hospital. "You ask about the aim of the movements. 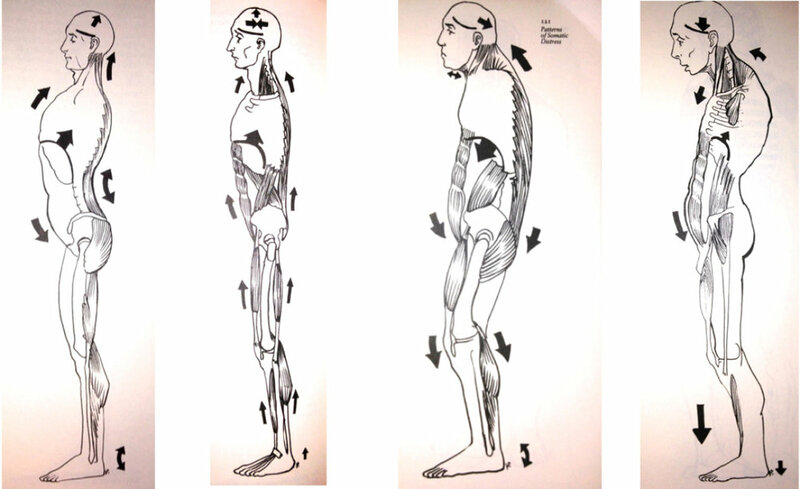 To each position of the body corresponds a certain inner state and, on the other hand, to each inner state corresponds a certain posture. A man, in his life, has a certain number of habitual postures and he passes from one to another without stopping at those between." "Our habitual postures are connected to habitual emotions and habitual thoughts in a strange dance - if you have a certain association, then you take a certain posture and have a certain feeling, so it's very difficult to think anything new, to feel anything new, or to sense in a new way - if you try to change it's impossible because each center is supported by the other two." Image from Keleman's Emotional Anatomy. Brewster proposes that, "if I can interfere with a posture then I find I'm free of both the emotion and the thought tied to that posture." The first thing is to become aware of our postures we go back to when we have certain thoughts or emotions - this is where Gurdjieff claims that the problems lies because we do not know what our habits are but to me this is also where the fun part begins: from observation, you start to observe what your habitual postural habits are and start to play games with it. "Taking new, unaccustomed postures enables you to observe yourself inside differently from the way you usually do in ordinary conditions." For both of these it would mean that you will need to become aware ("to stop sleeping") of your existing habits, and in best case that an honest and caring (group of) partner(s) helps you to become aware. A couple of examples of the work of people I've met who promote this practice using movement as a tool I shared below.